Focusing on the present in your day-to-day life can have a significant impact on your overall well-being. Dwelling on the past or worrying about the future can easily pull you out of the present moment, leaving you feeling anxious or gloomy. Mindfulness offers a way for you to live in the moment, so you can enjoy a less stressful and more fulfilling life. You can incorporate mindfulness into your daily routine in several ways. The simple act of breathing is something that is easy to take for granted. Breathing happens automatically, but what happens when you pause to focus on it? Doing this is an effective way to connect with your body, instead of focusing on distracting thoughts. When you take a few minutes to focus only on your breathing, you may feel an instant sense of calm. It also helps to pull your mind away from stressful thoughts or fears. Eating serves a practical purpose when it comes to nutrition, but it can also be a way to focus on the present. If you are a fast eater or multitasker during meal time, start getting in the habit of being mindful during meals. As you eat, take time to appreciate the taste, smell, appearance and texture of your food. In addition to being present, you may also end up feeling fuller when you're done. Whether you're sitting at your desk, walking down the street, waiting in your car at a red light or relaxing at home, you can practice mindfulness by focusing on each one of your senses. Focus on what you see, hear, taste, smell and feel in any given moment. This small act can help you feel calmer and clear your mind of clutter. Meditation is an important part of training your brain to be more mindful. This practice can also give your emotional well-being a boost. If you're stressed, anxious or feeling overwhelmed, meditating can give you a sense of inner peace. Keep in mind that the more you work on meditating, the easier it becomes. Set aside ten minutes per day to start. Then gradually increase your meditation time. There are several ways to meditate, but one of the easiest is focusing on deep breathing in a quiet environment. No matter which meditation technique you end up using, you'll be working on letting your thoughts drift by without focusing on any of them, which can help make mindfulness a regular habit. One of the biggest challenges of being mindful is slowing your mind down enough to practice it. When you're trying to do several tasks at once or running from one errand to another, it's common for your thoughts to race right along with you. Before starting a new task, take a few moments and focus on one thing. For example, when you get in your car to drive to work or the store, stop and focus on how your body feels sitting in the driver's seat. Before answering your phone, pause for a moment to focus on the sound of it ringing. These little pauses give your mind brief breaks in between tasks, which can give you a boost of much needed mental energy. 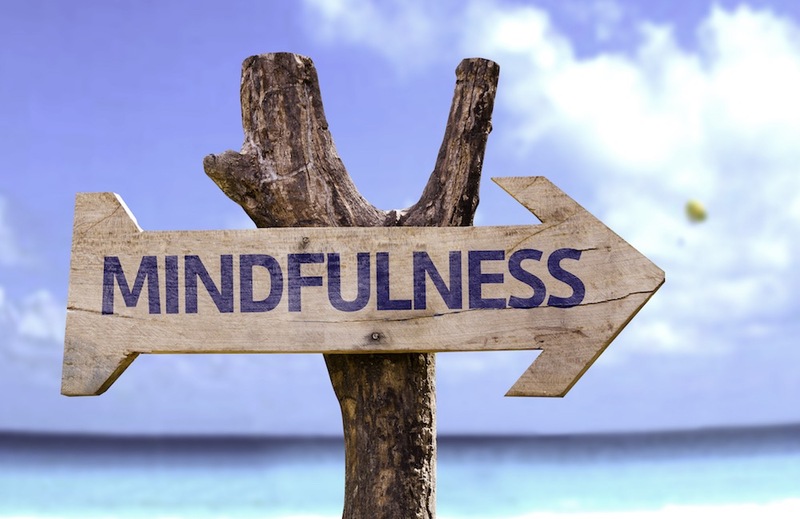 These are just five things you can do to make mindfulness a daily habit. Keep in mind that putting these tips into practice on a routine basis, while adding other mindfulness techniques, can help them become second nature.